It is good for Christians to spend time studying other religions. Christians are commanded by Jesus to go and make disciples. If Christians are to expect other people to listen to the message of Christ because we hold it to be true and the only way to salvation, it would greatly show other people that we truly care about them, by first knowing what they believe. I will attempt to start with Hindus, their beliefs and practices, and try to make connections to the Gospel of Jesus Christ from their beliefs, as Paul did with the men of Athens in Acts 17. Hinduism originated in India. Its roots go back over 4000 years ago. The Harappa culture was an ancient civilization in the Indus River Valley before 2000 BC. They were very advanced in some ways. Many symbols from this culture exist in Hinduism, so it is suspected that aspects of Hinduism arose from this culture. Around 2000 BC there was an immigration of a group of people called the Aryans from modern day Russia. It is here during this time that a melting pot effect took place. The gods of the Harrapa culture and the Aryan culture began to blend and mix. They had many, many gods, some of them are still worshiped today, but many of them are not. Worship of these gods took place at fire altars where sacrifices of grains, milk, and animals were made, as well as the use of sacred chants. The sacred chants of this time were later written down, forming what is now called the Vedas. The Vedas are the only revealed scriptures of Hinduism, meaning that the authors did not create them, but they only heard them and passed them down to later generations. The good questions to ask here is, who exactly revealed these and who exactly first received them? These answers when compared to the Gospels do not have historical reliability. The Vedas consists of four collections of writings – the oldest of which is the Rig Veda. If you go to Barnes and Noble or Borders and check the Hindu section you will certainly find this book. 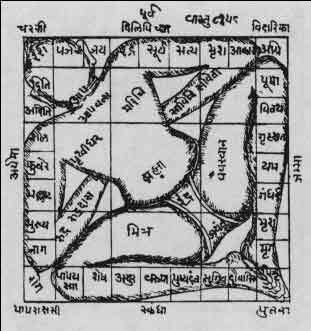 The Rig Veda contains an account of the formation of the world, claiming that the universe, as we know it, was formed from the sacrifice of the God Purusha. This means that the universe itself was made from a divine substance, thus in Hinduism, all things are at their deepest level divine. The universe consisting of Purusha’s body is therefore eternal. From this sacrifice, the other gods were then formed, or evolved. It’s all very unclear in Hinduism how all of this unfolded. In fact, the account of Purusha’s sacrifice of himself as the formation of the universe is even questioned by the Vedas themselves, because the Rig also recognizes that no one was there to witness and confirm its genesis. Still none of this initial information about Hinduism has touched on the core teachings of the religion, simply its formation and its explanation of the universe’s existence, but connections to Jesus can still be made in conversation with a Hindu from these teachings alone. It can be noted that Christians also believe in the special nature of the universe, that Genesis teaches that all things was created by God and that their original state was “very good.” However, it was not formed from God’s divine nature. Instead, it was created by God out of nothing through his spoken Word. Although, Christians don’t believe that God sacrificed himself in the formation of the world, we do believe that there was a sacrifice made before the creation of the world. Revelation 13:8 refers to Jesus as “the Lamb that was slain from the creation of the world.” Instead of saying that God sacrificed himself to create the world, Christianity teaches that God in the person of Jesus Christ sacrificed himself to save the world before the world was even created. This of course is possible because God is outside of linear history, unrestrained by the fourth dimension, time. Christians certainly agree with Hindus that the divine was involved in the creation of the universe and that a sacrifice on the part of God was made from the beginning. Christians however believe that this God has revealed Himself clearly through his Word delivered through the prophets and apostles of the Bible, and through the person of Jesus Christ, so that there isn’t any doubt about who God is, who we are, and what God has done for us. Rig Veda – The universe was created from the cosmic sacrifice of Purusha. 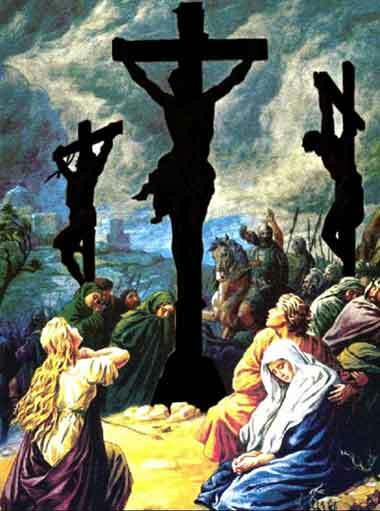 Christianity – Before the foundations of the world, Christ was slain.